Relax on the jetty or balcony and let the panorama take over. 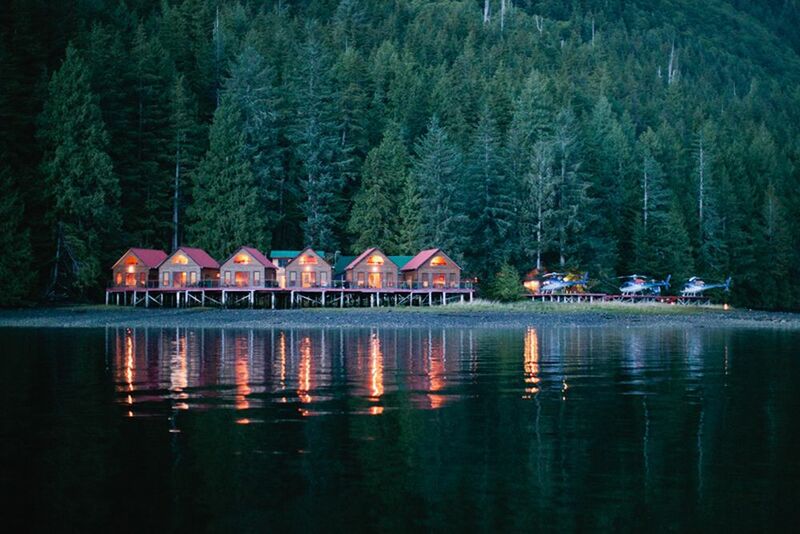 Stay in a secluded cabin in the middle of Canadian nature. This could be your view on your next holiday. 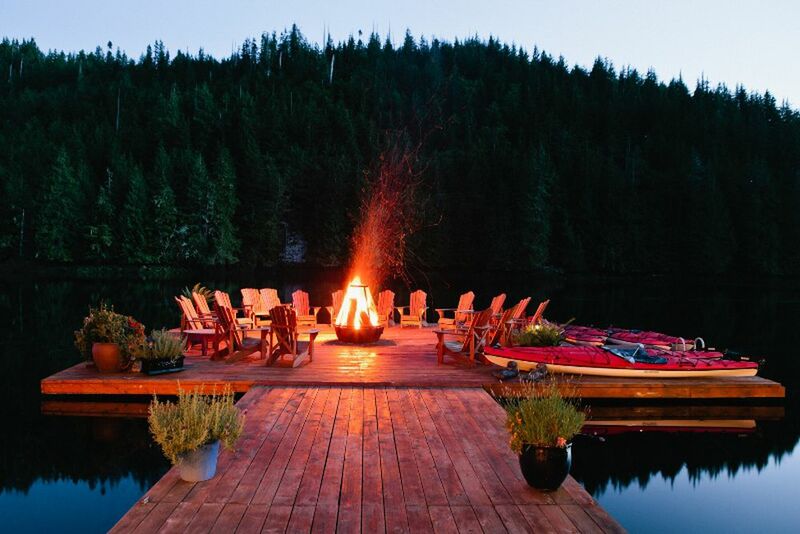 Cozy evenings are pre-programmed at this fire pit on the pier. 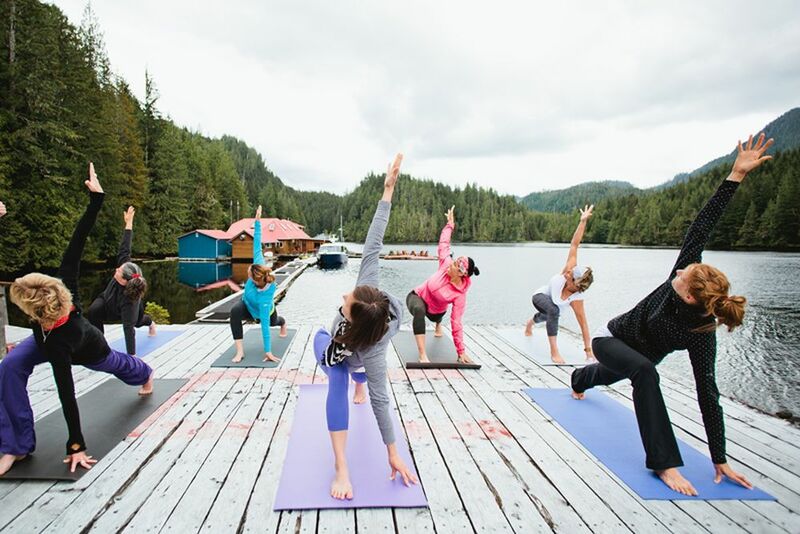 Yoga in the midst of nature and silence high above Port McNeill. Located right on the water, allowing the practice of many water sports. 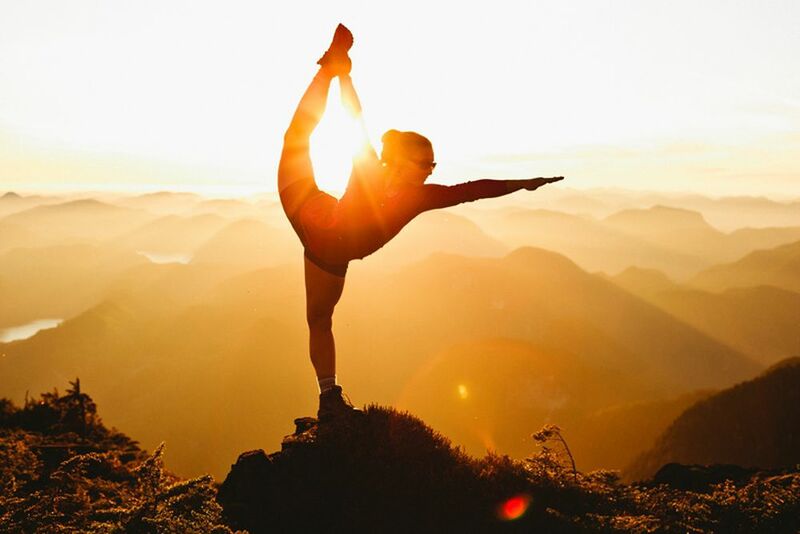 Start the morning with yoga in the morning. 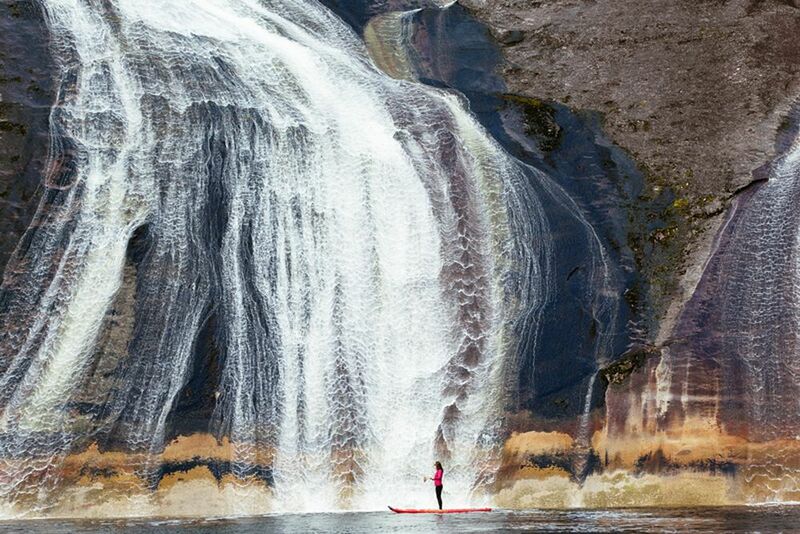 Stand Up Paddling is one of the many activities available and a great way to explore the breathtaking scenery around you. 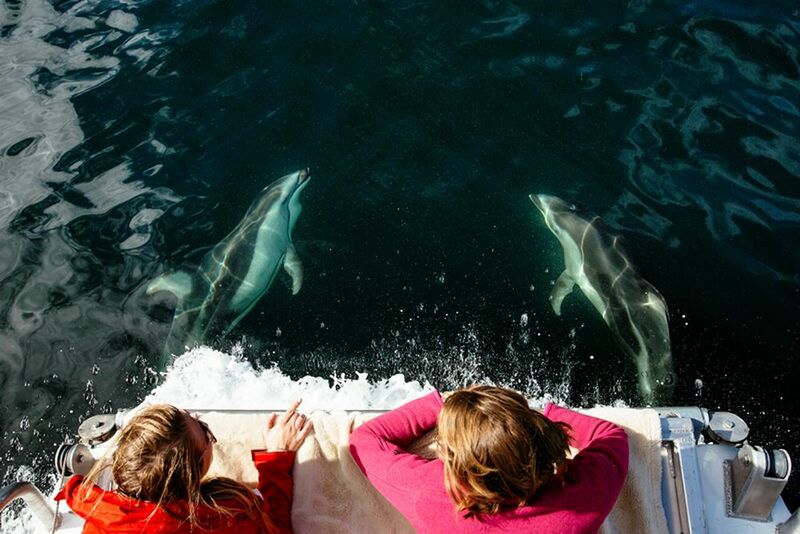 Experience the sea creatures from very close. 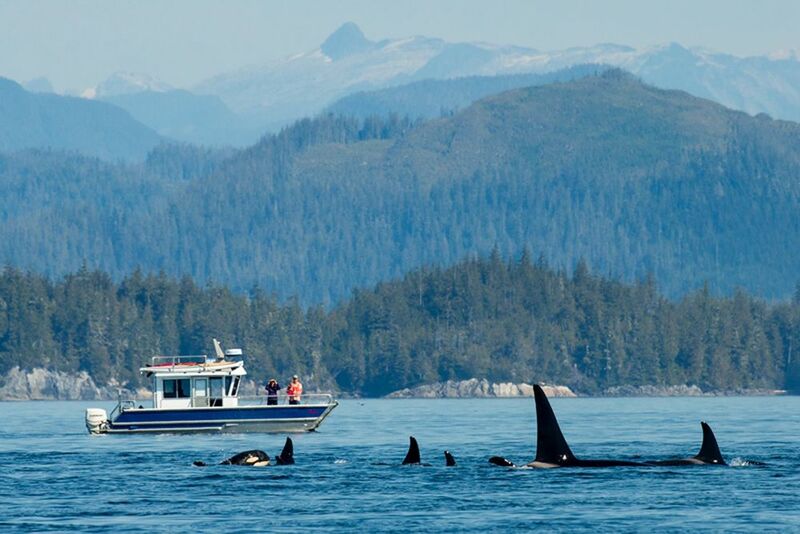 A group of orcas is near the resort. 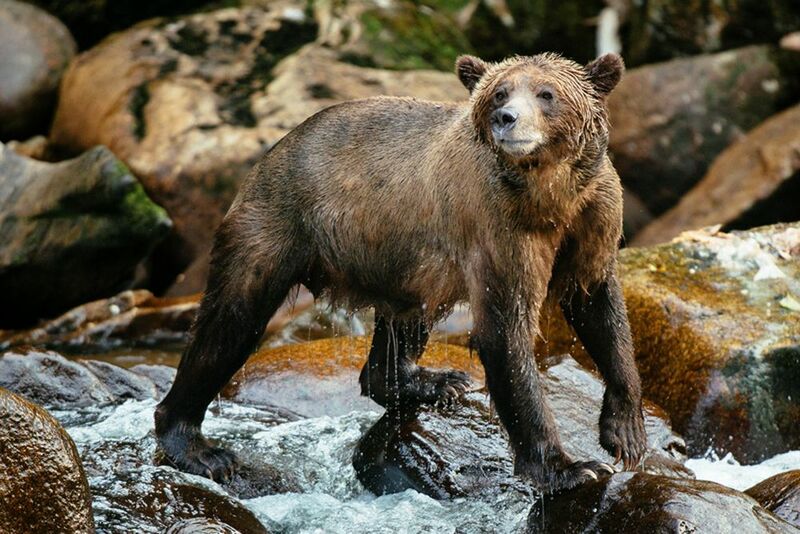 Watch grizzlies catching salmon in the rivers. Feel-good atmosphere in the middle of the wilderness of Canada. Eat in the evening in the cozy wooden hut, surrounded by a rustic atmosphere. You will feel the island flair right upon arrival. Freshly caught seafood completes your stay in Canada. After an exciting day, this jacuzzi is just waiting for you to relax. Even the comfortable bathroom offers spectacular views. 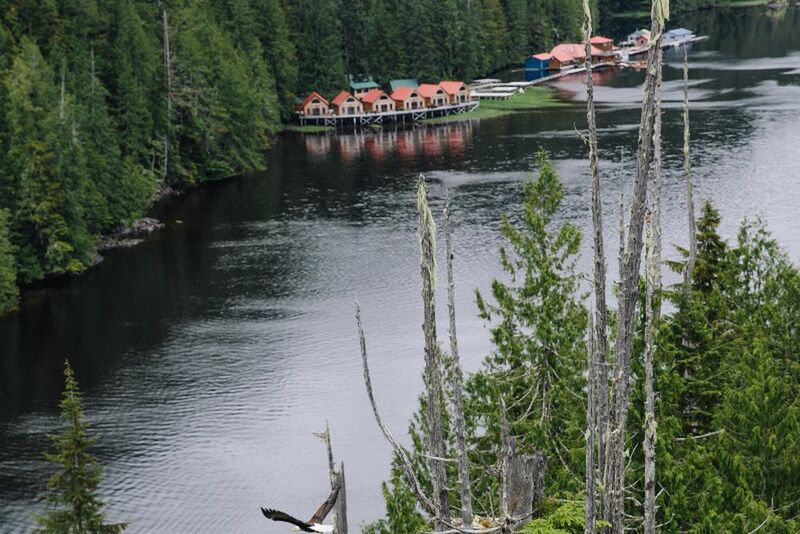 Plan your journey into the Great Bear Rainforest where incredible adventure can be found. 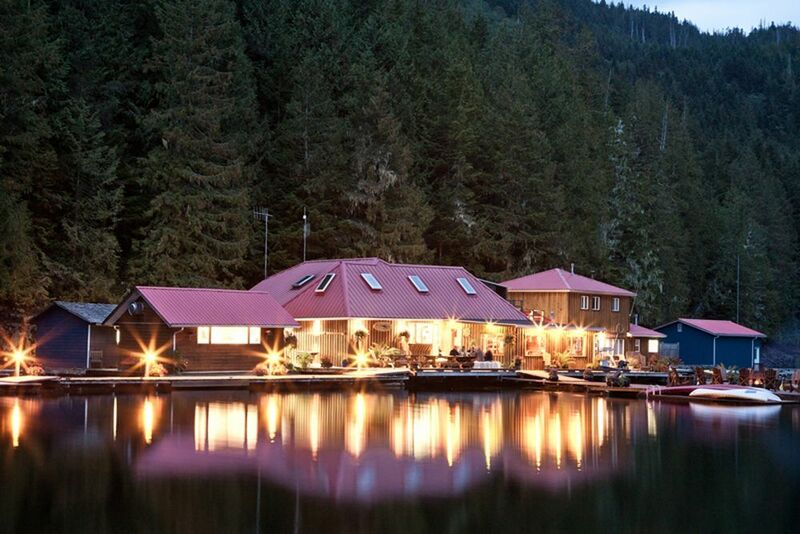 Nimmo Bay is a family of dreamers setting the stage for life’s wild stories. Come and enjoy an active, comfortable and peaceful stay while retaining all the comforts of home. Your journey begins the moment you step out of the plane in Vancouver. 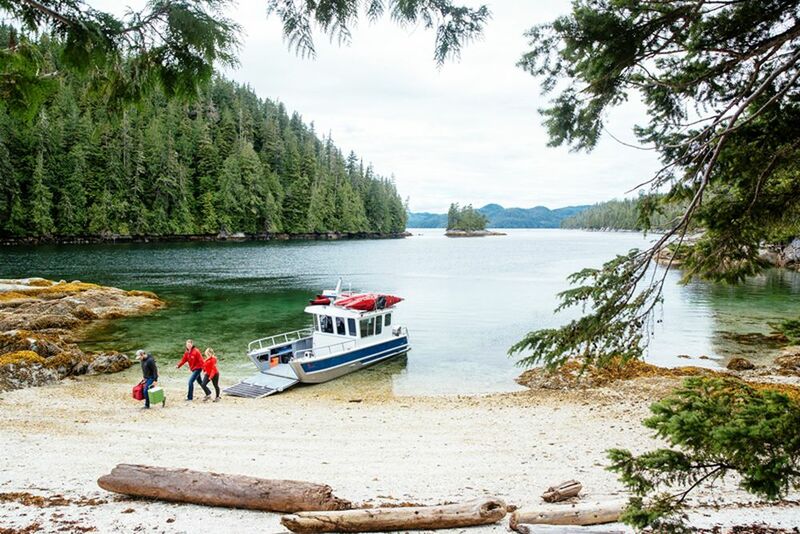 Only accessible via small planes or helicopters, Nimmo Bay’s tranquility takes you away from reality and into the deep wilderness. Pristine coastal rivers, 50,000 square meters of wilderness, helicopter rides to have lunch on a 10,000-year-old glacier, or brisk swims in a natural waterfall plunge pool are among the unique memories you will create when visiting. Whether you are active in sports, or calm and relaxed, Nimmo Bay Resort has a variety of activities available for all guests. Activities include: yoga classes, kayaking, boating, stand-up paddle boarding, hiking, paintball, rock climbing, snorkeling, whale watching, bear watching, waterfall tours, visits to cultural First Nation museums, fishing lessons, beach walks, strolls through the old forests, and swimming in the lakes. To be adequately equipped for all activities, you will also receive extensive adventure equipment, e.g. hiking boots, Watt pants, rain jacket and pants, wet suits, fishing gear, and more. Unplug, relax and slow down to the rhythms of nature. 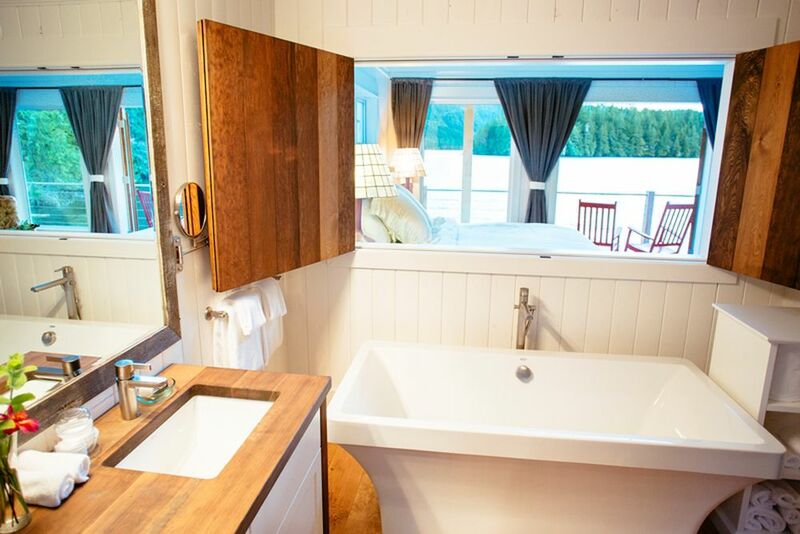 The private cabins are an intimate and exhilarating wilderness experience in its purest form. On site, there is a magnificent five-thousand-foot waterfall that supplies Nimmo Bay with green power and their sweet, delicious drinking water. The resort is built in harmony with nature, practicing an extensive recycling program and ecologically efficient, state-of-the-art sewage treatment system. 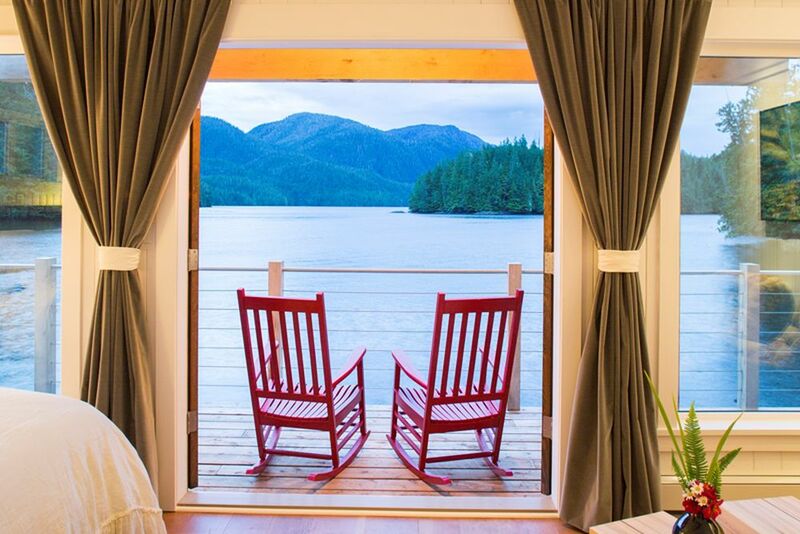 The Nimmo Bay Wilderness Resort offers an all-inclusive stay so your holiday needs no stress to plan. Wake up your taste buds with a three-course breakfast in the family-style dining room. Freshly baked pastries, fresh fruit, yogurt and granola are offered for a delectable breakfast. At noon, enjoy a gourmet picnic at constantly changing locations, depending on where your activities take you. 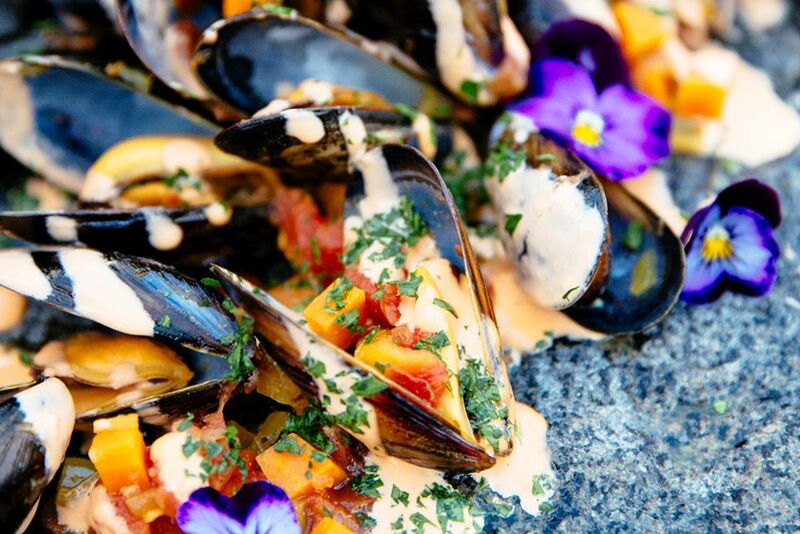 One day you are eating a scrumptious lunch on a glacier, maybe the next on the sandy beach, or near the glistening lakeshore. Your lunch consists of sandwiches, soups and baked goods with guaranteed breathtaking panoramic views. After the adventurous day, sit back in the evening and treat yourself to a four-course menu served in a relaxed and comfortable environment. In the evening, sit around the campfire together with your family, or other guests at the resort, and listen to Canadian ridge songs accompanied by guitar. During your Canadian adventure, spend your nights in one of the nine comfortable wooden cabins, located directly above the brisk water. 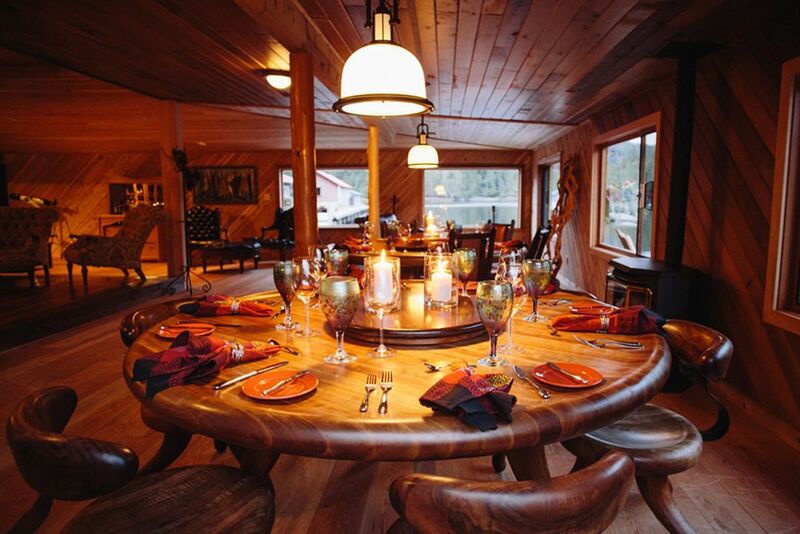 British Columbia traditions meet characteristic construction of wooden houses to give guests elegant, modern interiors. The houses were designed so that they fit perfectly into the nature. 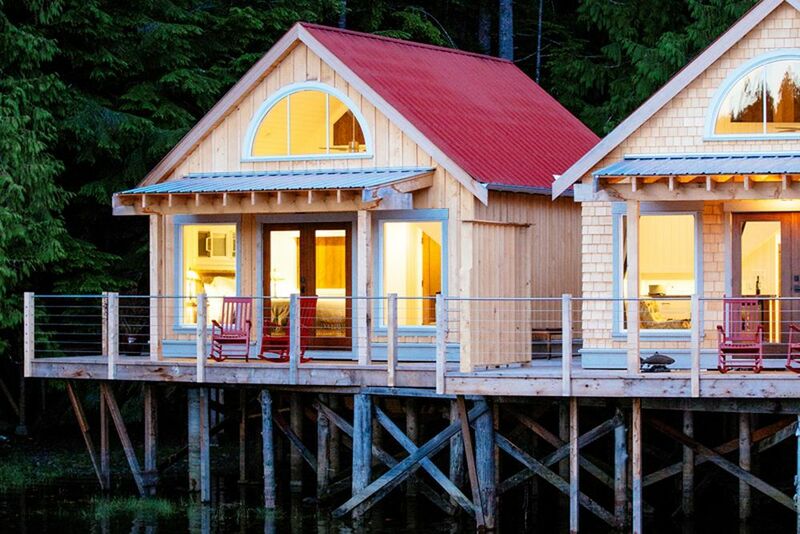 Some of the houses are built on stilts, giving guests the opportunity to watch the glistening tide at your cabin. The cabins are divided into two bedrooms, a bathroom, living room, small kitchen and a seating area outside. Also included are homemade cookies and chocolate truffles, Mission Hill red and white wine, wine glasses, a small but well stocked fridge, a selection of teas, pots and cups, cotton bathrobes, daily fresh towels, Great Bear Rainforest shower and toiletries kit, hair dryer, duvets and pillows. Egyptian cotton blanket, a free metal “Nimmo Bay” water bottle for each guest, umbrellas, iron and ironing board and laundry. As guests of the resort, you can also use the space where a pool table, stocked minibar, satellite television and aids for stargazers are ready for use! 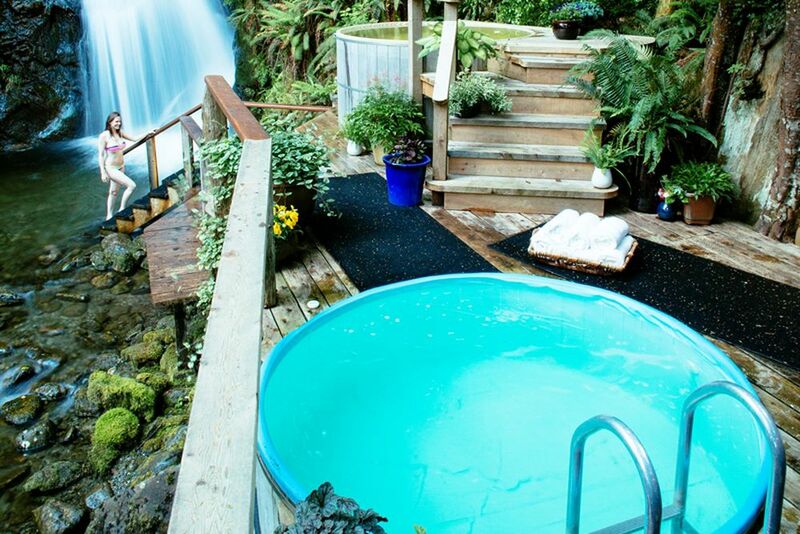 Guests of Nimmo Bay Wilderness Resort enjoy access to hot tubs and the gym. Also book a relaxing massage after a day full of adventure. You're free to choose from the following activities: yoga classes, kayaking, boat tours, stand-up paddle boarding, hiking, paintball, rock climbing, snorkeling, whale watching, bear watching, waterfall tours, cultural first nation visits Museums, fishing lessons, beach walks, walks through the ancient forests and swimming in the lakes. To be adequately equipped for all activities, you will also receive extensive adventure equipment including hiking boots, waders, rain jackets and trousers, wetsuits, fishing gear and much more. Please note that the advertised travel price already includes a transfer by seaplane from Port Hardy. Many guests fly from Vancouver to Port Hardy. Please note that if you wish a different transfer, no reduction of the tour price will be made.